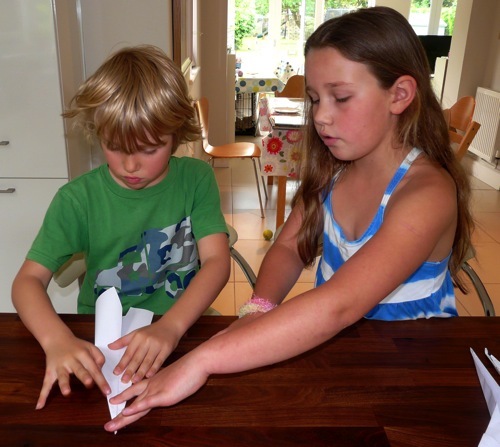 J(8) made paper aeroplanes from his Klutz Paper Aeroplanes book. 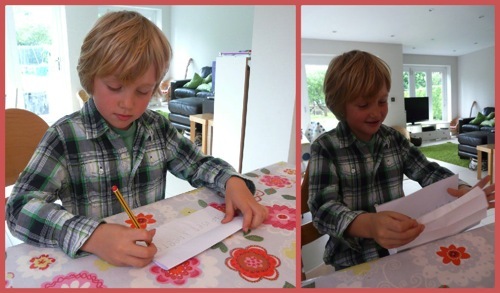 Then C(9) taught him how to make an aeroplane she told him she invented when she was eight. My children are both quite intense and although they have great fun playing together, things don’t always go smoothly, so my heart sings when I see them working together like this. 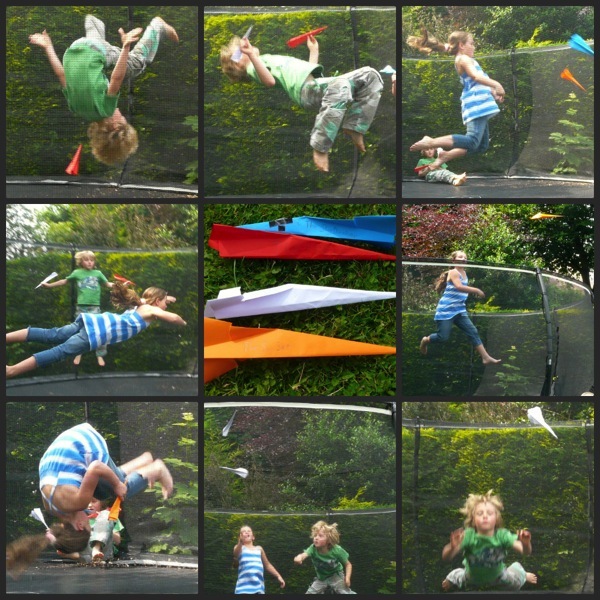 They had great fun flying their aeroplanes on the trampoline. 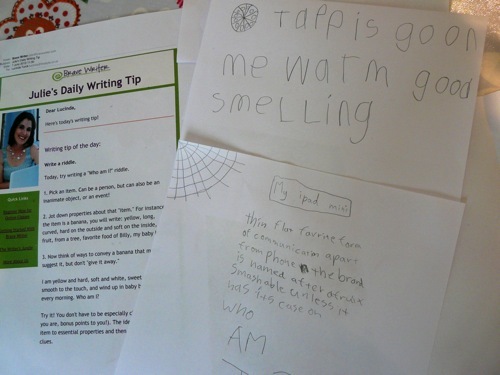 I’ve been collecting Brave Writer’s free Daily Writing Tips for writing inspiration. This week we wrote riddles to read to each other. 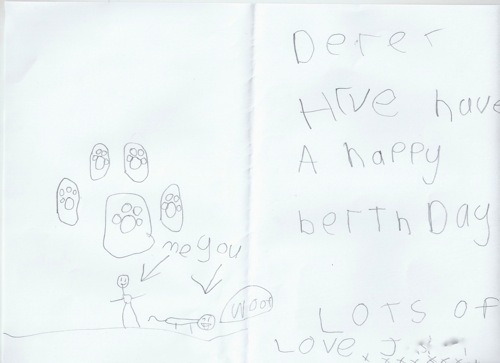 Even reluctant writer J(8) joined in with enthusiasm! 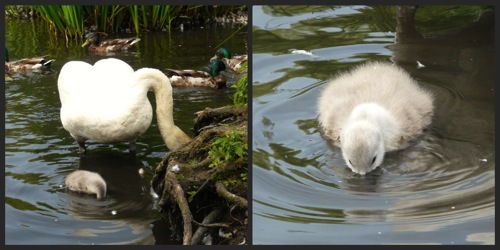 We made it to our nature-study pond for the first time since we returned from Norway. 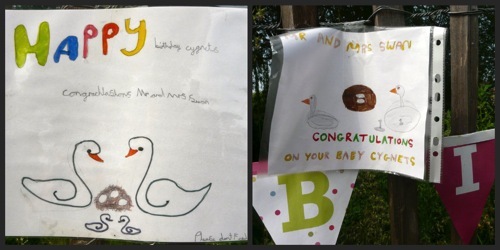 On our last visit we were surprised to find our swan still nesting, but this time we knew from the “Happy Birthday” bunting someone had put up that something had happened! 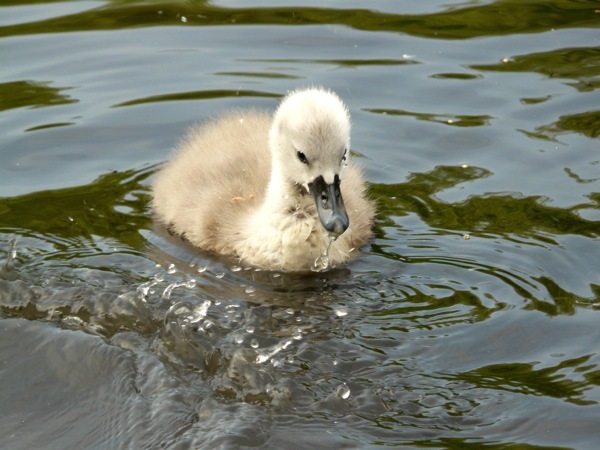 There was just one cygnet left, but he (or she) was worth the wait. The children have named it “Shadow”. 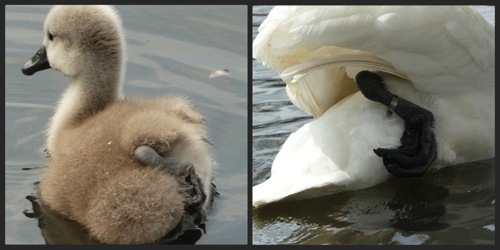 We noticed how the cygnet held its leg in the same way we had seen one of its parents do. 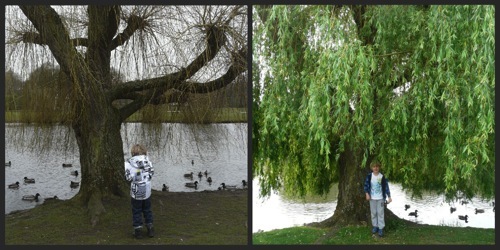 J(8) commented on how much his willow tree has changed since March. Continuing the nature study theme, I was sceptical when J(8) ran in to tell me there was a bug “as big as my hand!” on the trampoline. We just don’t get bugs that big in England. 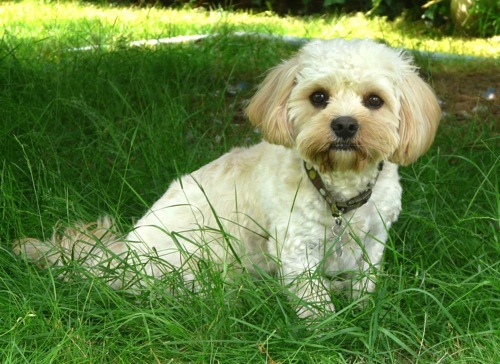 He wasn’t far off, though – this little lady measured an impressive 6 centimetres! 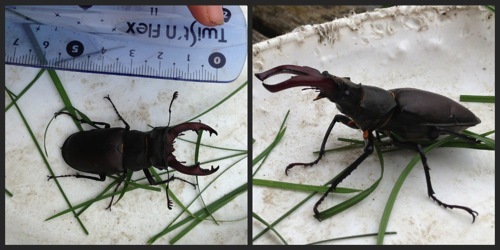 We think we identified it as a (dying) female stag beetle, which we were both pleased to see described as “rare”. Apparently they die shortly after laying eggs in or near rotting wood, which J(8) decided must be our old shed (we could probably do our nature study there next year). Playing Consequences. My kids can’t get enough of this game. 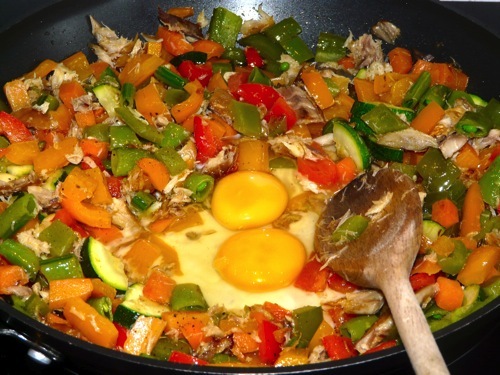 Mackerel stir fry – loads of veggies, mackerel and a couple of eggs stirred in. We eat it with rice. Byline, the blog reading app I’ve used for over two years, has updated to Feedly. I’m so happy that my transition from Google Reader on 1 July will be completely seamless! I love Byline’s unfussy interface and the fact that it caches content for offline reading.